This is the Peugeot 206 Exterior lighting continued, buzzer, interior lighting System wiring diagams. 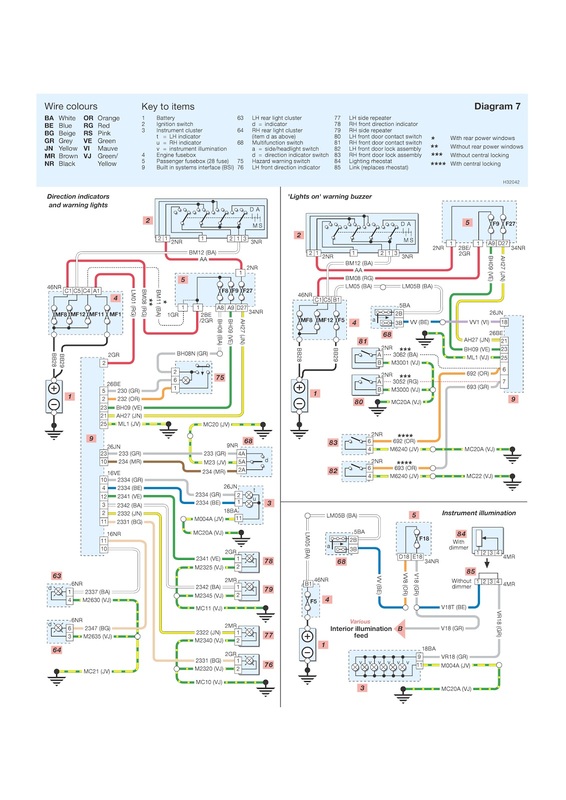 In this schematic you will see the color codes as you had seen in the previous posts on Peugeot 206. This is the car I had been put on my list :). Best car in the some years before. But when it comes with the wiring problems, you may consult this post and its series as your references in finding a guidelines of wiring schematic. Well, let's discuss it now. BA White, BE Blue, BG Beige, GR Grey, JN Yellow, MR Brown, NR Black, OR Orange, RG Red, RS Pink, VE Green, VI Mauve, VJ Green/Yellow. 1 Battery, 2 Ignition switch, 3 Instrument cluster, t = LH indicator, u = RH indicator, v = instrument illumination, 4 Engine fusebox, 5 Passenger fusebox (28 fuse), 9 Built in systems interface (BSI), 63 LH rear light cluster, d = indicator, 64 RH rear light cluster, (item d as above), 68 Multifunction switch, a = side/headlight switch, d = direction indicator switch, 75 Hazard warning switch, 76 LH front direction indicator, 77 LH side repeater, 8 RH front direction indicator, 79 RH side repeater, 80 LH front door contact switch, 81 RH front door contact switch, 82 LH front door lock assembly, 83 RH front door lock assembly, 84 Lighting rheostat, 85 Link (replaces rheostat). Those are the parts you have to understand as well before attempting on your wiring works. I do guaranteed for your wiring works to succeed after you comprehend both. And here is the very clear and readable image. click it to enlarge, or using picasa photo viewer for the best result.